Steven Gerrard insists he has received no indication that Dominic Solanke will be allowed to leave Liverpool in January. The striker has been heavily linked with a loan switch come the turn of the year as a means of gaining regular first team football. Solanke is yet to make a senior appearance on Merseyside so far this season and has featured just twice for Neil Critchley’s U23s, scoring on both occasions. Rangers have subsequently emerged as potential suitors in light of Gerrard’s ties at Anfield and an apparent agreement granting him first refusal of youth loan departures. Despite such rumours, the Liverpool legend has played down talk of a move. 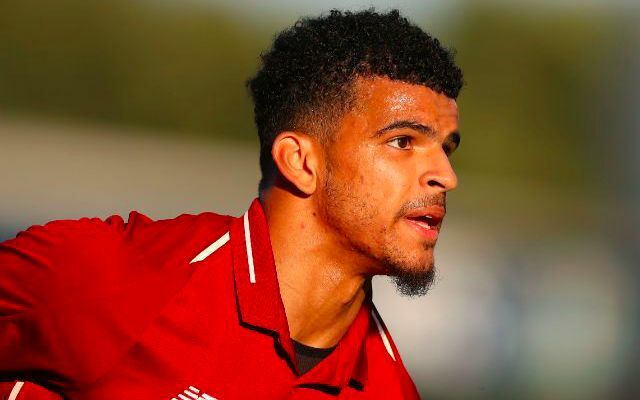 Gerrard’s subdued response to Solanke’s future is likely in professional respect of Liverpool’s plans rather than an outright dismissal of interest in the forward. Crystal Palace are meanwhile targeting a January loan for the Englishman as they look to add much-needed firepower to their attacking ranks. Roy Hodgson’s men have scored just 14 goals in the Premier League so far this season, with Wilfried Zaha struggling for form in the final third and Christian Benteke having been out with a knee injury since the beginning of September. It would come as no surprise were Gerrard to join the Eagles in pursuing the 21-year-old having plucked both Ryan Kent and Ovie Ejaria from Liverpool’s U23s setup during the summer. That said, the latter recently cut short his temporary deal and returned to Merseyside having made 28 appearances across all competitions during his time in Scotland.